CBS is not a network known for making brash, impulsive (or even exciting) decisions, so it was definitely jarring when the network gave The Word that politi-comic Stephen Colbert would be replacing David Letterman on The Late Show following his retirement next year. It put an end to one debate and spearheaded another: who will replace Colbert in that coveted post-Daily Show time slot? It’s a long, tall drink of an order that requires a performer capable of captivating audiences both with a signature interview style and a point of view that allows everyone to feel like they’re also in on the joke. Assuming that Comedy Central doesn’t just fill the time slot with repeats of South Park, here are seven people we think could gratifyingly fill the America-sized hole in our hearts that Colbert will be clawing his way out of. If you’re going to replace one of the best comedians in the business, why not use one of the other best comedians in the business? This L.A. mainstay comic is a big part of how the burgeoning alt comedy scene in the 1990s became the standard a decade later, and his stand-up specials have become increasingly more esoteric and brilliant over the years. Tompkins has proven himself an entertainer of many hats across TV, radio and a wide range of podcasts. (The Paul F Tompkast, The Thrilling Adventure Hour and The Dead Authors Podcast are especially notable.) His past includes writing for The Daily Show and Real Time with Bill Maher, and his stand-up is filled with enough political touches that his presence wouldn’t be a huge leap for those hungry for Washington D.C. humor. Tompkins is currently the host of Fusion’s No, You Shut Up!, a Henson Alternative puppet panel discussion series that takes on issues of the day in a rage-filled manner. But it’s his web series Speakeasy that would work best transitioning to cable, as its low-key celebrity interviews over drinks is a welcome change to the traditional format. Watch his talk with Sons of Anarchy creator Kurt Sutter below. If extraterrestrials come to Earth in the future to sum up humanity’s history, how much room do you think “Late Night Talk Show Wars” would get in the write-up? 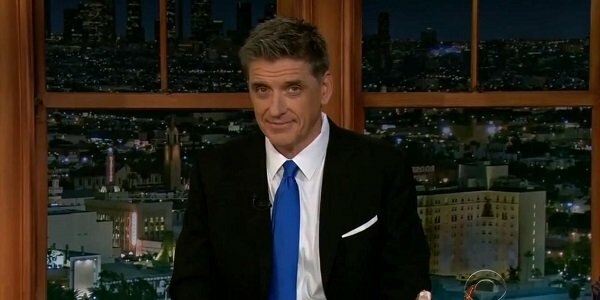 Craig Ferguson has been the host of The Late Late Show since 2005 – the same year Colbert’s spinoff started – and it would have been gracious and smart for CBS to promote the cheery Scot. But they didn’t, and his contract expires at the end of the year, which has spawned rumors on all sides of the spectrum. Ferguson hasn’t shown any animosity, welcoming Colbert to the CBS team, and joking about taking over The Colbert Report in 2015. So why not make that a reality? He has always been far sillier and good-natured than CBS has ever been known to be, and Comedy Central is the perfect place to ramp that zany humor up a few notches. Admittedly, Ferguson might need to find a gimmick to latch on to. Interviews with Jon Hamm about his dating show video are fun, but I think the host is primed for meatier material. We’re not dumb enough to think only one woman should be considered for this job, but network executives rarely give us reason to expect gender equality. 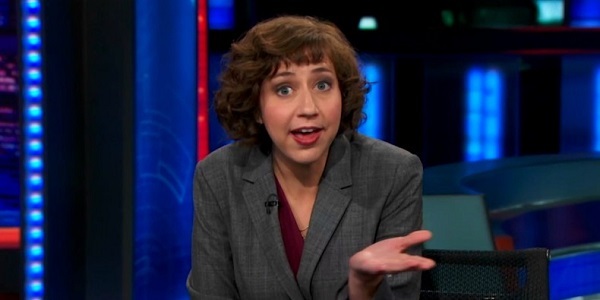 Flight of the Conchords and 30 Rock actress Kristen Schaal might not seem like the most obvious prospect for a front-and-center host, but she shares Colbert’s talent for playing aggressively aloof characters who let irony fly right over their heads. While many across the Internet are calling for Tina Fey or Chelsea Handler to get the job, neither of them really reflect Comedy Central’s anarchic nature the way Schaal does. Her stand-up sets are occasionally surreal, and she’s well-versed in voice work on shows like Bob’s Burgers and Gravity Falls, so is it possible the world needs a meta animated interview show with lots of animals and hollering? It’s no surprise that Daily Show correspondent Samantha Bee is also on everyone’s minds as a replacement, but let’s not forget that Schaal appears regularly on that series as the “Senior Women’s Issues Correspondent,” and her below segment on the children’s dating service KDate should prove how well she could do in the host’s chair. 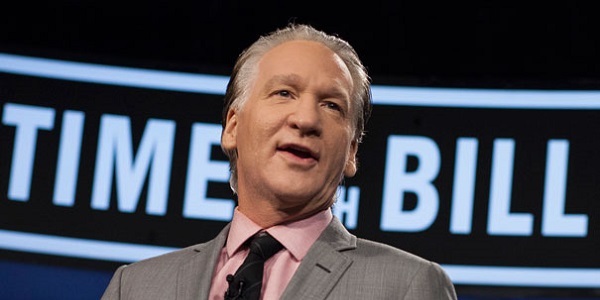 One of the pioneers of “making bipartisan audiences uncomfortable with far-leaning political views,” Maher has built a career out of his bullheaded opinions, sneakily transitioning from conservative to liberal in the past decade or so, all while maintaining a strict anti-religious stance. His brutishness and love of controversy make his 12-years-and-running HBO panel show Real Time with Bill Maher hard to imagine within the confines of a cable network, but TV isn’t what it was when that show began. While both The Daily Show and The Colbert Report deliver solid satire that makes you think twice about our country, the interviews and discussions are generally fluffier and are vehicles for more jokes and product plugs. Maher would give Comedy Central actual political discourse, and maybe that’s what we need to counter Jon Stewart’s winking delivery. Check out the awesome conversation below between Maher and Science Guy Bill Nye, following Nye’s witty and electric debate with New Earther Ken Ham over the legitimacy of creationism. Sometimes all that Daily Show talk about the government and foreign affairs can really get a person low. And if you’re looking for a quick high, you’d be hard pressed to find a better source than the pot-loving, pop culture-skewing Doug Benson. Sure, they could try to stick Benson in a smart suit and get him to interview celebs from behind a desk, or they could even create a game show based on the “Leonard Maltin Game” from his podcast Doug Loves Movies. But what Comedy Central really needs to do is start airing and producing episodes of Benson’s web series Getting Doug with High, in which different comedians join Benson in getting stoned off their gourd for a 50-minute-or-so multi-threaded conversation about EVERYTHING. If there is any way to combat the stale, pre-written interviews that talk shows are known for, it’s introducing a potent intoxicant into the situation. Granted, this project wouldn’t get the same guest list as The Colbert Report, but I’m sure they’d find some open-minded surprises. Benson has smoked out everyone from David Cross to Dominic Monaghan to the Workaholics trio, but it doesn’t get much better than watching the team-up of marijuana legend Tommy Chong and boozehound Kyle Kinane. Let’s say the development heads at Comedy Central all took a trip to South America and imbibed on ayahuasca once a week for a month, and upon returning they had the idea to pretend as if The Colbert Report wasn’t losing its host at all. So character genius Sacha Baron Cohen is brought in to play the role of Colbert’s right wing pundit, and the series keeps its wittier segments while moving farther down the rabbit hole of awkward human interactions. Granted, both Colbert and Cohen are separately recognizable for mocking the Powers That Be in the past, but when they combine to become the same person, no one will be able to escape. No one can escape! Cohen was most recently seen in Anchorman 2 and on FXX’s rebranded airings of Ali G: Rezurection, but he really caused heads to turn last year during the Britannia Awards when he “killed” an awards presenter just before accepting an award. Former SportsCenter host Craig Kilborn has ties to both sides of this story, so why not bring him back around for a third appearance? 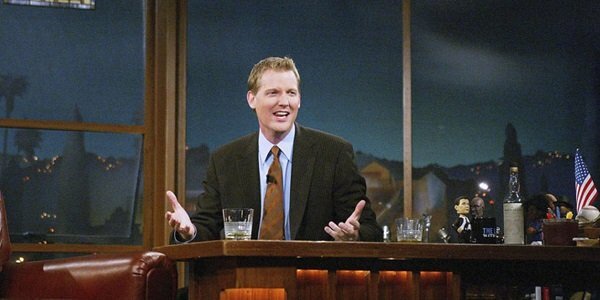 Kilborn was the first host of The Daily Show when it began in 1996, and he was the guy who CBS chose to bring the laughs as Tom Snyder’s replacement on The Late Late Show, a gig he left in 2004. (That’s where Ferguson came in.) He went on to later host The Kilborn File for some Fox affiliates, but that only lasted a brief six weeks. Kilborn could come full circle by bringing 5 Questions back to Comedy Central following the show he helped create. I’d leave Yambo behind though. For his penultimate Daily Show episode, Kilborn interviewed soon-to-be host and game-changer Jon Stewart, and the results are decidedly different than they would be if this interview happened today.